Owens Valley mammals include species from several different biogeographic regions–including the Great Basin, Mojave Desert, White-Inyo Mountains, and Sierra Nevada Mountains–as well as species unique to the groundwater-dependent alkali meadows on the valley floor. The Owens Valley vole (Microtus Californicus vallicola), a nocturnal short-tailed vole, makes its home in groundwater-dependent meadows on the valley floor. Its current status–severely threatened by degradation of its habitat due to groundwater pumping and grazing–is unknown. In contrast, several other Owens Valley rodents, including kangaroo mice species (Microdipodops) and pocket mice species (Perognathus), prefer more arid, sandy habitats on the valley floor and on alluvial fans; they extract the water they need from the seeds they eat. Mule deer (Odocoileus hemionus) overwinter on the alluvial fans at the toes of the Sierra Nevada in the west and frequently migrate through the Owens River valley to and from winter range in the volcanic tablelands at the north end of the valley. Mountain lions (Felis concolor), not coincidentally, occupy the same range. On the east side of the valley, desert bighorn sheep (Ovis canadensis nelsoni) range from the ridges of the White and Inyo Mountains down to relatively low elevations in stream canyons on the west side of the escarpment, but are rarely seen crossing the valley floor. Several species of bats occupy Owens Valley’s evening skies, including a wealth of brown bats (both Eptesicus fuscus and California myotis) and western pipistrelles (Pipistrellus hesperus). Deepest Valley (Genny Smith books: 1995) contains detailed and lively descriptions of many of these and many other Owens Valley mammals. Natural History of the White-Inyo Range (University of California Press: 1991) covers many of the rest. For an idea of how difficult it is to find the Owens Valley vole nowadays, see an online thesis regarding Owens Valley vole ecology. 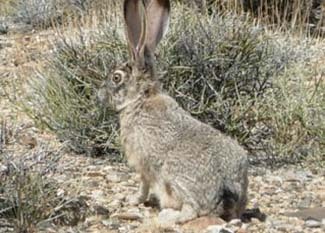 The black-tailed hare, or jackrabbit (Lepus californicus), leads a difficult life. Young hares are born with their eyes open and are able to nurse and run soon after. They spend much of the first few weeks of their lives huddling alone in shallow depressions beneath desert shrubs. Like some other lagomorphs (e.g., certain species of pika), female jackrabbits visit their young only to nurse, possibly to reduce the chance of attracting a predator to their newborns. If surprised close to her young, a female jackrabbit will sometimes wait in an obvious place for a potential predator to notice her and then leave the area with the predator in pursuit. Jackrabbits eat grasses, herbs, and shrubs, often twice (i.e., once again after elimination from the caecum). They reproduce year-round and have year-round predators as well, including eagles and hawks, coyotes and bobcats, gopher snakes, rattlesnakes, owls, and humans.